Meet the most delicious soup anywhere, France or otherwise. Thanks to the likes of Julia Child, (who single-handedly ignited the world’s love affair with this humble creation), it has been visited upon by many – including moi! In an attempt to not be redundant, recreate the wheel or go where many have already gone, I’m thinking the valuable lesson here is to share the basic method, of which there are ample stellar examples already in existence (my choice, French Guy Cooking). Master the basic method, then check out a few of my twists and turns that only up the smack factor – with a few tiny tweaks, this one-of-a-kind French classic can be enjoyed as is, or dressed to the nines, or somewhere in between! Bon appétit! 7. When ready to serve, preheat the oven to 400°F. Cut any rustic bread /baguette into 1″ thick slices, and bake them for 6-8 minutes until the bread is toasted and crispy (or do this in a toaster). Remove from the oven and rub each slice with a couple of swipes of a garlic clove. Cube the slices into 1″-size pieces and set aside. 10. 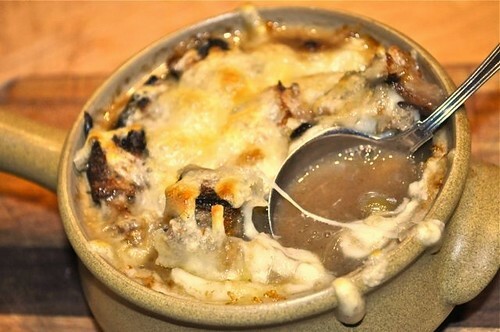 Put soup bowls on a baking tray and place under the broiler for 3-4 minutes until the cheese is brown and bubbly. Serve immediately.